The best way to learn anything is to make something really stupid and fun with it. 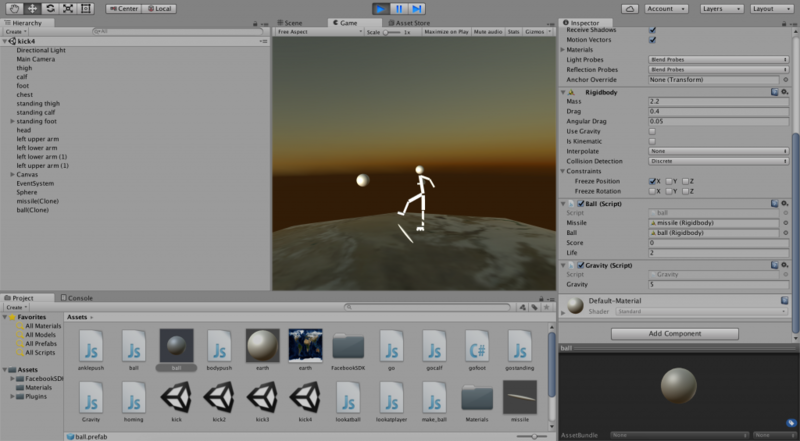 And today I’ve started learning Unity. It reminds of of the old Flash way of working- creating stuff on a stage and then breathing some life into it with some code. It’s a lot of fun and a bit magical. I want to make a few really simple games to get the hang of it. The year is 3054. After the first televised football (soccer to you Americans) reached the Cat’s Paw nebula (it’s a real place I googled it), the inhabitants mistakenly take it for an invitation to play their favourite game: Intergalactic asteroid ball, and send forth and endless torrent of light speed footballs, fashioned after the footballs they’ve seen us play with, towards the Earth. Earth’s government quickly realise nuclear missiles will be too self-defeating to use and normal missiles will take some time to destroy such gigantic balls. So they agreed the only semi-sensible course of action is to create a giant humanoid football player to play keepy-uppy with these intergalactic asteroid-balls while the military did their thing and blew them out of the sky. A railroad is constructed around the equator for the robo-man to roller-skate upon. Finally a pilot is genetically engineered to be the football brain. That pilot is you. Your task is to hold off the inundation of alien galactic balls until such a time as the earth can think of a less stupid solution. Are you ready? Then let’s play…Intergalactic Roller Ball.